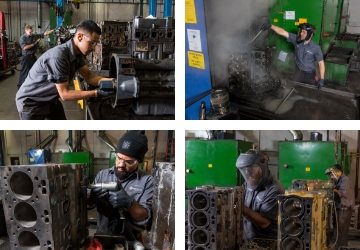 At the epicenter of our state-of-the-art service center in Ridgefield, Washington, you’ll find a buzz of activity centered around our diesel engine remanufacture operation. A high-pitched whir from drills is constant and the hiss from steam fills the air. It’s here that our factory-trained technicians tackle this complex process to deliver our customers a great product and value. Each step in a reman is critical and dictates the outcome. That’s where the skill and experience from these techs shines. Their knowledge and ability allows for us to help customers keep their machines running. So, thanks to the reman team for the job you perform and the value you bring to the company and our customers.